I hadn't had time to go to the library this week until I thought I had better go and pick something up so I have SOME loot to talk about this week! It's not much. The fact that I am focussing on reading my own books this month continues to mean that I am not borrowing many books, and so my number of library books out continues to drop, which I think is still a good thing. 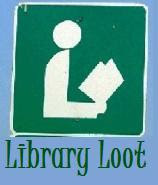 Feel free to add your link to Mr Linky so we can all see what loot you picked up from the library! 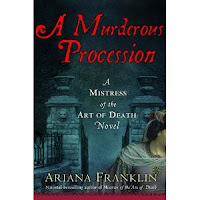 A Murderous Procession by Ariana Franklin - I have very much enjoyed reading the first few books in this series, and so I have been waiting for this one to come out! I am lucky enough to be the first person to borrow this book as well! I love it when that happens! The Boy with Striped Pyjamas by John Boyne - I have actually read this before, but my son wants to read it now. Apparently they are going to be reading it for school but the school doesn't have enough copies to go around. Sounds a bit strange but if he actually reads it I will be happy! Essential as Anything - This is a best of album for Australian band Mental as Anything. They are a fun band with some very silly songs but bring back memories from the 80s for me, and I am really looking forward to reacquainting myself with more of their songs! And just because I had completely forgotten about this song, this is the lead singer of Mental as Anything, with his solo song Concrete and Clay. Nice 80s hair! I've been wanting to read Ariana Franklin's series but just haven't been able to get to it yet! I got Catching Fire this week! The Boy with Striped Pyjama is on my Fill In the Gaps list. Hope he likes it. Ooh! I have heard great things about The Boy in the Striped Pajamas and can't wait to hear what you think of it. I haven't been to the library in ages. We owe a heck of a lot in fines due to the loss of some of the kid's books, so we tend to just buy books at this point. It works out well because the kids love to reread and they also share their books. I am envious you have the new Ariana Franklin. I do rnjoy that series - happy reading! I haven't heard of the Ariana Franklin series and will have to check these out. I always like to see your loot! and I loved the videos. Long-time lurker, first time looter! I absolutely loved (if that is the proper word) The Boy in the Striped Pajamas. A simple story yet powerfully told. I have been reading so many library books lately and neglecting my piles of books that I've bought. I think I'll try to balance that better next month. I hadn't heard of either of those two books before, but they look interesting. Happy reading! I have the first Ariana Franklin lined up and I've heard great things. 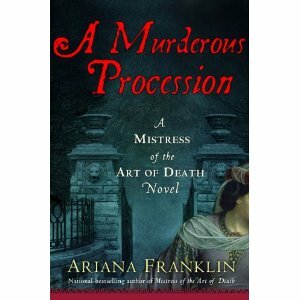 I only discovered recently that Ariana Franklin was a pen name for Diana Norman, and I've enjoyed her books. Congratulations on getting that shiny new copy! I've heard good things of The Boy in the Striped Pajamas. Even I go through phases - sometimes I use the library, sometimes I read the books I have. I love Mental As Anything. Brings back happy memories of being a young teenager and watching Countdown or Hey Hey It's Saturday (when it was on Saturday morning and 1000 times better than it's later night time incarnation).